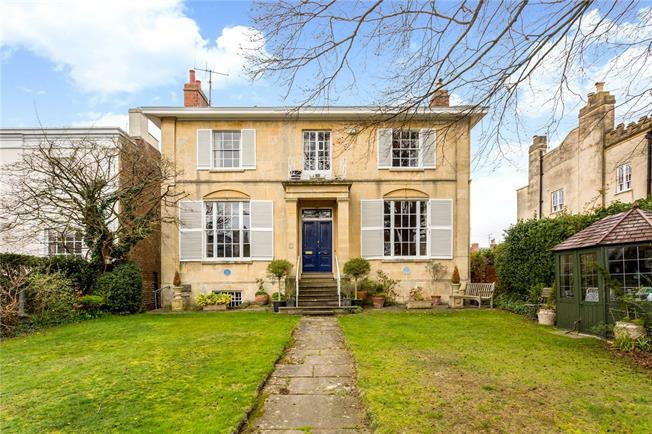 4 Bedroom Detached House For Sale in Cheltenham for Guide Price £1,000,000. An imposing Grade II listed family residence from c.1834-40 with dressed stone elevations, a porch with square Doric columns and, most unusually, two Civic Society blue plaques for notable former residents honouring Sir Ralph Richardson who was born in this house in December 1902 and Dame Sidney Browne, the founder of the Royal College of Nursing who also lived here. Whilst requiring some updating, this magnificent family residence possesses well-proportioned accommodation retaining many of its period features and has been lived in by the same family for 47 years. The accommodation comprises a reception vestibule with ornate cornice and double doors to the hall; drawing room with three-quarter length sash window to the front with shutters, marble fireplace to open fire, floral and egg & dart cornice and ceiling rose; dining room with three-quarter length sash window to front with shutters, ornate fireplace, dado rail; breakfast room/snug with fireplace, ceiling rose, ornate floral and egg & dart cornice; bathroom; kitchen with electric hob, 2 ovens, dishwasher, fridge and freezer. On the lower ground floor there is a large garage accessed from Tivoli Lane with space for 2 tandem parked cars and space to park another car on the lane outside. There are a series of rooms at this level which could be used for various purposes but at present comprise a wine cellar with wine bins; a room retaining the meat hooks in the ceiling, a further store room and a pantry; the three major rooms all having windows. On the first floor are 4 bedrooms, two being good sized doubles with fireplaces and built-in wardrobes, and a shower room.